Kayla Keyes grew up in Northern Kentucky but quickly pursued a life of travel and ocean conservation. She studied Marine Science and Biology at Coastal Carolina University, while working at the Ripley’s Aquarium in South Carolina. She then worked as a Animal Experience Specialist II at the Newport Aquarium where she also gained experience as an assistant biologist for three years. Kayla then then pursued a Masters Degree in Conservation Biology through Miami University’s Global Field Program and is set to graduate at the end of 2017. Through her master’s program she has discovered her passion for travel and global environmental conservation. 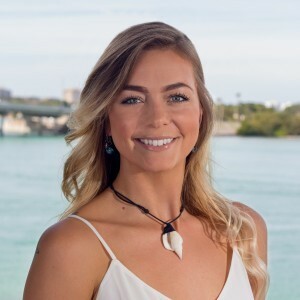 She has traveled abroad to several countries including Belize, Australia, Panama and Guyana working and volunteering with various marine education and environmental conservation organizations such as Earth Watch, Reef Ecologic and Earth Expeditions. Kayla currently works with Mote's Community Engagement Program, bringing Mote research and science based education to underserved and underrepresented partnerships throughout Florida. Kayla has a strong background in animal husbandry and loves sharing this knowledge with others. She works directly with Mote's Mobile Education Exhibit where she is responsible for the husbandry, maintenance and educational programs of the exhibit. It is Kayla’s mission to bridge the world of environmental consciousness, ocean conservation and sustainable living with mainstream culture through acts of environmental stewardship, which she is currently working to accomplish through Mote’s community outreaches.